The National Union of Journalists (NUJ) has this week rejected a membership application because it came from a member of the British National Party. The application had been refused because of the individual's work as a BNP organiser, the union confirmed to Journalism.co.uk. The individual's links with the party were clearly stated as part of the application. "His actions aren't compatible with membership of the NUJ," a spokesman said, adding that other unions would adhere to similar rules. 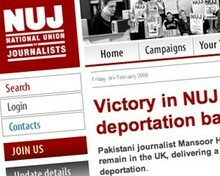 A BNP member entering the union would contradict with the NUJ's Code of Conduct, which all journalists joining the union must sign, the spokesman suggested. Section 10 of the code says : "A journalist (…) produces no material likely to lead to hatred or discrimination on the grounds of a person's age, gender, race, colour, creed, legal status, disability, marital status, or sexual orientation." At an event promoting the cross-media EXPOSE the BNP campaign, deputy general secretary of the union Michelle Stanistreet called on the British Media to exact more scrutiny of the BNP and its policies. "Journalism comes with a responsibility. We have to face the reality of what happens when we don't do our job properly. We are encouraging our members to scrutinise people from across the political parties. But at the minute the BNP just isn't being scrutinised properly," she said. "We need people to know the difference between what these people are saying on TV and what they actually stand for. This needs to be exposed through the media." The NUJ criticised BBC's decision to put Nick Griffin on Question Time in October: "The union argues that the format of the show does not allow the BNP’s dishonest propaganda to be properly challenged." In February the union launched a guide to journalists reporting the BNP ahead of the general election. A BNP spokesperson said the decision by the union was "hardly surprising". "The NUJ bosses wouldn't want anyone blowing the whistle on the extent of their doctoring of news reports concerning the British National Party," the spokesperson said.